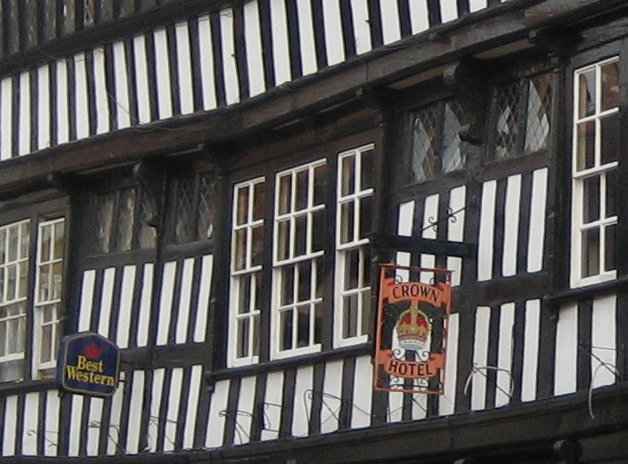 Goodbye to Market Drayton, the home of gingerbread. From my B&B, it was only steps to my route along the Shropshire Union Canal. Today was to be a shorter day because Nantwich offered an assured bed at a shorter distance. That, at any rate, was today's best-laid plan. So why not go on to Crewe, the centroid of the nation's rail system? That's a reason in itself. Also, I try to keep off main roads, and to aim for interesting towns rather than cities, especially industrial or just plain big ones. Yesterday, I headed north from Telford on minor roads in order to pick up the Shropshire Union Canal ("the Shroppie") at Market Drayton. I've been interested in the Shroppie ever since noticing that it would offer a flat and mostly direct route all the way to Chester and Merseyside. 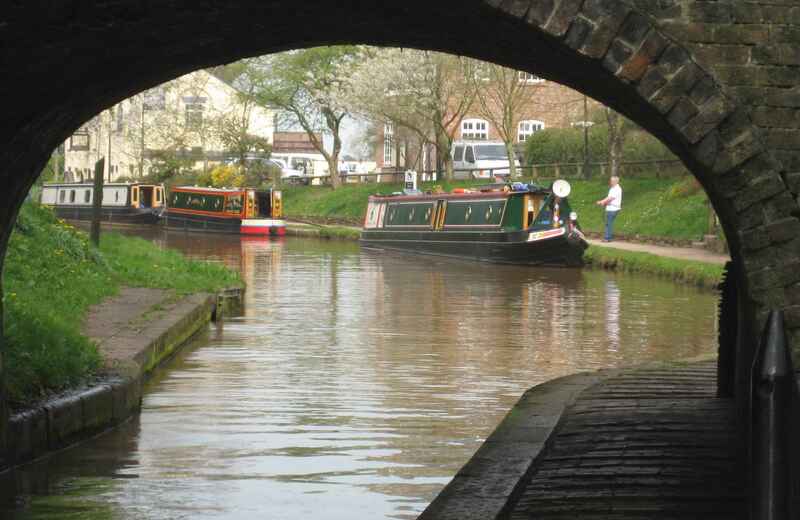 Later, I corresponded with the Shropshire Union Canal Society, which has been restoring and maintaining the canal. They assured me that there's a walkable towpath along the entire Shroppie, though they did also warn of muddy patches. People I'd met had reinforced that warning even without my asking. My maps didn't identify mud, but they did show sections of laddered locks - something I'd never seen and was anxious to view and photograph. These locks also lay along today's route. I had long chats with vacationers about the wonderful weather, their dogs, my hike, their next destination, and my boots. I renamed myself Daryl the Dawdler, and basked in my laziness. Near Audlem, I came across a canalboat getting a new name. The painter sat on a chair on the bank, and expertly (as signwriters can) painted the new lettering, while a lady on the boat watched. I chatted to both of them, and they seemed honest enough. Then, a day later, I heard on the local television that a canalboat had been stolen on this stretch of the canal. The police indicated that it had been painted blue and renamed. Later they reported that it had been taken out of the area. I did not connect the dots until I was back home. 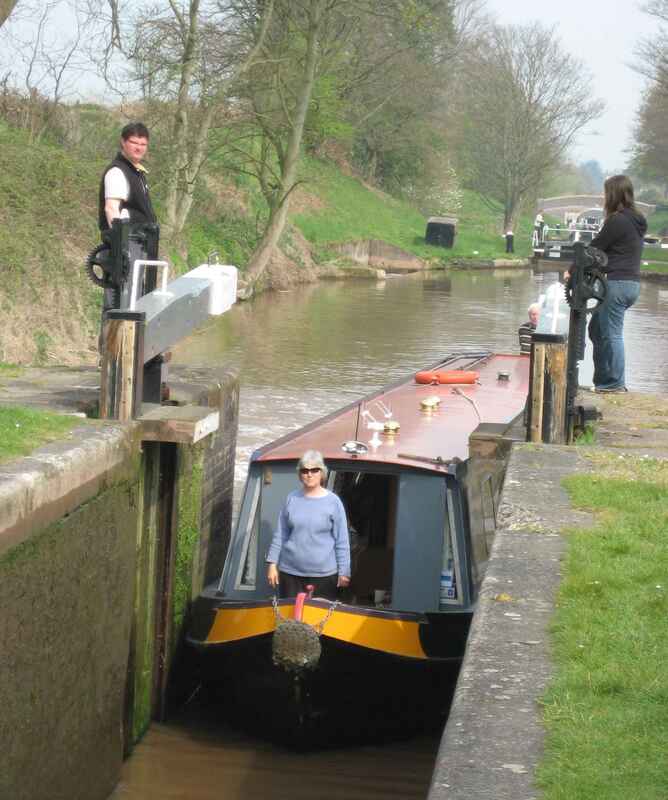 There, on a large screen, I had a chance to look afresh at my canalboat photo. The boat was not only blue, but it looked like the paint was fresh. 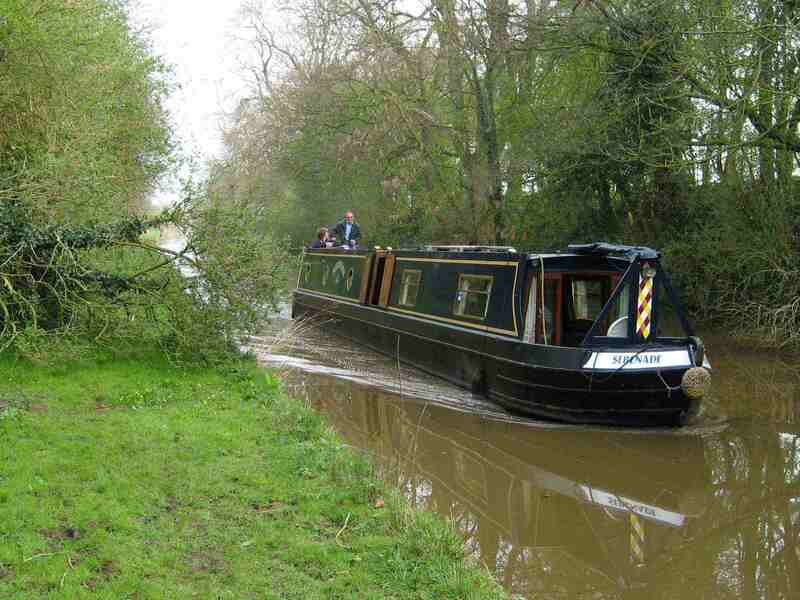 The dots connected, correctly or not, and I emailed the Market Drayton police and offered my information, and my photo of the boat and the two people attending it. It was now about two months after I passed by, but it seemed that the case had not been solved. Andrew King of that local constabulary asked for the photo, which I duly sent. But I doubt that these folks were the perpetrators. I still had to walk approximately ten more miles. Having dawdled as described, I now had an attack of "Am I there yet?" This caused me to skip a visit to the once-secret nuclear bunker at Hack Green, right on the route, which was an underground command post during the cold war. It is now an exhibition that contains decommissioned nuclear bombs and features a simulation of what would have happened during a nuclear attack. Of equal interest to me would have been the fact that Hack Green was used as a decoy site during WW2, with the intention of luring nighttime Luftwaffe bombers from the valuable railway junction of nearby Crewe. The techniques for this were fascinating. The first-used German system of radio navigation was fairly quickly sabotaged by the British by broadcasting like signals in many areas, which caused the bombers to find they were in the “right” place when they weren’t. The second-used system was much cleverer. Bombers flew to their target along one radio beam. Other radio beams lay across this path, each to warn that the target was near, and the last of these triggered a stopwatch in the bomber which automatically released the bombs at the right place. An antidote to this was eventually found in the form of a British cross-beam that triggered the stopwatch to start at the wrong place. Those interested might want to look up Knickebein and X-Gerät. Eventually, I toiled into Nantwich feeling overdue for a rest, but instead became the Nantwich wanderer. First I tried The Limes guesthouse, which was fully booked, and then the Railway Hotel which only had doubles, and wouldn't rent to a single so early. Then I was off to The Old Vaults, a pub which had a bed without breakfast or bathroom for an astonishing price given that the bed wasn't made up and the communal bathrooms looked grubby. I vowed I would rather sleep in a ditch than sleep there – and later I nearly got my wish. Next I set off in search of the Tourist Information Centre (TIC), getting directions first to its old location in the main square, and then having to find its new location in the Civic Buildings. The TIC wasn't manned at first, and the man who eventually arrived was affable but ineffective. Apparently, the B&Bs are refusing to get on the TIC list because they would first have to pay for an inspection. He did call a couple of places, promising a 20-minute walk in the right direction. But I have gotten savvy about 20-minute walks in the right direction, and on further enquiry determined he was sending me three miles (75 minutes) in the wrong direction. Having also exhausted all the establishments on my PDA list, as well as those in the Yellow Pages, I then called places that were highly-recommended by the locals: The Malbank, The Red Cow, and The Crown. I drew a blank at all three. Undeterred, or at least motivated by the painful anticipation of that roadside ditch, I then visited The Malbank and The Red Cow, only to be told in person what they had told me on the phone. Eventually, displaying weariness and defeat, the receptionist at The Crown took pity on me, and checked me into Room number 1 - whose shower door was hanging off and whose entry door directly faced the door through which all the guests entered – including, later, the noisy and the drunk. It was now 5.30 pm - though I stopped the hiking day clock rather earlier because I didn't think it was meant to record epic accommodation search time. Relaxing after my shower, during which I had to support the shower door, I trimmed my toenails. The left big toe, blackened by a blood blister, then began to ooze blood out of the edge of the cut nail. I wrapped it in tissue paper, got dressed, and went out in search of a better band-aid than I'd got - only to find the stores closed. After that, I failed to find food that I considered edible in my now-foul mood. And, yes, this was also one of those places where my wifi service wasn’t working at both places I tried. I retreated to my room, ate canned sardines, washed my clothes, and drank copious cups of room tea. "Môre is nog 'n dag," my grandmother used to say, borrowing another tongue. ("Tomorrow is another day.") I hope so, I thought, putting antiseptic balm on my toe and wishing I had balm for my soul. Not all hiking experiences are fun. In fact some are downright un-fun.